As we get older, we grow out of many things: tricycles, swing sets, sandboxes, and even Legos. We expect it to happen because it makes sense. What doesn’t make sense is when a company thinks it’s outgrown the value of thought leadership. Not only can well-positioned thought leadership, fostered by strategic content marketing, expand any business’s branding and sales, but it can also solidify a foundation of trust, education, longevity, and awareness. Startups and small- to mid-sized enterprises tend to lean heavily toward thought leadership, and almost half of executives think it makes them more competitive. They’re right, of course: Content allows businesses to communicate expertly with the public in a quick and cost-effective manner. Seventy percent of consumers get information about businesses and product recommendations by reading articles—not by sifting through advertisements—and the average American spends about 490 minutes of each day immersed in digital media. In other words, thought leadership is a huge opportunity for you to get your brand and your ideas in front of millions of people. The issue comes when the organization grows. Scaling naturally decreases flexibility, making thought leadership more complex. It’s easier for consumers to see the human side of a small mom-and-pop shop than a giant international corporation. One company that’s bucking the trend and hitting gold with thought leadership is outdoor recreation company REI. As a retailer, its name is globally recognized, but it has suffered online due to heightened competition. To try to woo customers and compete in the online market, it created niche content that provides value to its customers. The company promotes itself as the place to learn about outdoor activities, which helps drive consumer confidence and sales. The key to using thought leadership effectively as a large business is to remain authentic. You don’t want your customers to see a faceless corporate entity; you want to appear relatable, genuine, and, above all, a go-to resource for valuable insights. 1. Consider what your audience wants to hear. In order to create content, you need to know your readers. Develop target customer personas, going into as much depth as you can until you have a good grasp on the problems they’re facing and how you can use your expertise to solve them. This is also a great opportunity to get your entire team involved in the content creation process. Every employee can bring something unique to the table, and those diverse insights will help customers see the human side of your company. The most authentic marketing strategies are audience-centric, meeting your customers where they are to deliver the message they need to hear at that moment. Solving problems for them will create a bond with your customers and give them a reason to come back to you when they’re facing another problem. 2. Don’t forget about your brand promise. For young startups, a brand promise is all you have to convince customers that you’re worth their time and money. But as your company grows, it can sometimes become more difficult to uphold that promise. It’s sometimes easy to get so caught up in your daily activities that you begin to lose focus on what that promise was in the first place. A thought leadership strategy, however, is the perfect opportunity to ensure you haven’t lost sight of that promise. Customers will know when you’re trying to fool them, and they won’t hesitate to call out a piece of content that contradicts your brand promise. Consistency is key to creating a successful brand image, and it involves regular checkups to ensure your message remains true to your company values. Your content needs to have standards to create a cohesive strategy across your various channels. And while each thought leader should be sharing her own thoughts and ideas in her own voice and style, everyone should be conforming to a specific set of guidelines so that the overall message remains consistent. Organization should also be a key component of your guidelines. A simple checklist of concepts, keywords, or links that each piece of content should contain will ensure that your content is consistent—even when you have multiple thought leaders. In addition, an editorial calendar is crucial to keep everything organized and allow all content creators the chance to collaborate and brainstorm. There are many tools available to keep your content organized, from the basic Google Calendar to blog management tools like WordPress to more advanced resources like Kapost and Trello. 4. Take advantage of influencers. Content creation doesn’t come naturally to many people, and large organizations, in particular, often struggle with content marketing. In fact, one study found that 81 percent of CMOs believe their businesses struggle when coming up with new ideas for thought leadership content. This is where content curation and influencers come into play. When you’re open to sharing content from aligned companies and individuals, you can expand your reach and enhance your narrative. The key word here is “aligned.” If you choose to work with influencers to help you create or promote your content, make sure they’re doing it because they truly believe in your brand—not just for the paycheck. This will give your content a more genuine and authentic tone because it’s coming from someone whose mission meshes with your brand’s. For example, Capitol Records recently partnered with Olay and Mode to create a few behind-the-scenes videos with Michelle Jubelirer, COO of Capitol Music Group and a powerful female role model in the music industry. The videos featured Olay products and gave young women advice about living their best lives while balancing their careers with parenthood and self-care, and they went viral—garnering more than 10 million views. They were so powerful because they were authentic and emotional, and they gave viewers something they wanted from brands and people they trusted. While scaling companies can expect to someday outgrow their workspaces, vendors, and perhaps even clients, they are never too large to incorporate smart thought leadership strategies into their sales and marketing mix. Meeting your customers where they are drops their resistance and opens the door to amazing, profitable, and genuine relationships. 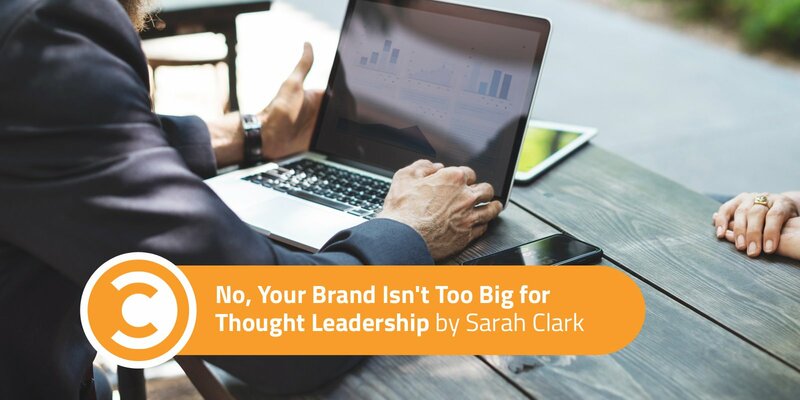 Sarah Clark is the president of Mitchell, an award-winning public relations firm that creates real conversations between people, businesses, and brands through strategic insights, customized conversations, and consumer engagement. Clark is one of the top strategic communications professionals in the country, with more than 25 years of experience in corporate communications and an exceptional track record in protecting corporate reputations and redefining perceptions in key areas of business.